Twitter reported earnings for its fiscal third quarter of 2014 on Monday. Revenue, earnings per share, and even monthly active users (MAUs) fell right in line with Wall Street expectations. There was no grand surprise, and the company’s stock tanked roughly 9% after the announcement. 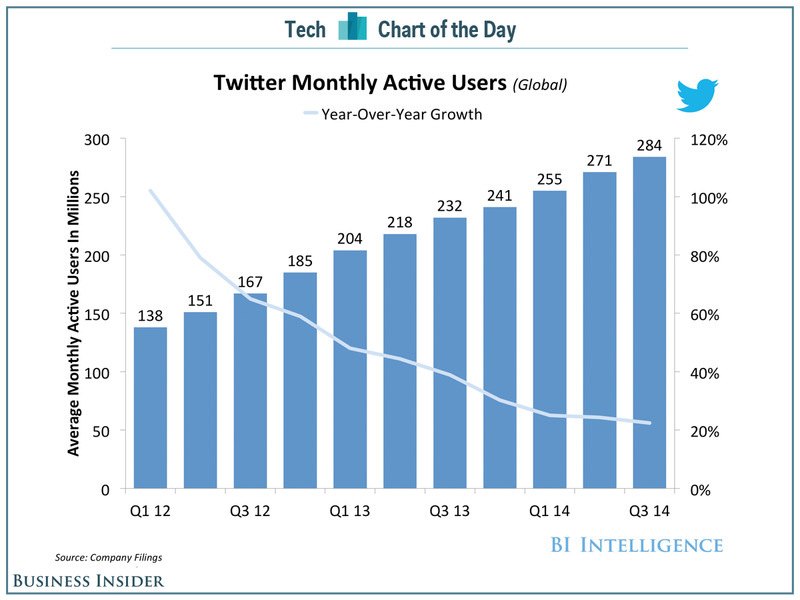 Twitter’s monthly active users are arguably the company’s most scrutinized metric, since everyone cares about how Twitter plans to regularly attract new users. But while membership rises each quarter, the growth of MAUs on the network continues to slow down. According to Twitter’s data charted for us by BI Intelligence, Twitter reported 284 million MAUs in Q3 — up from 271 million in Q2 — but year-over-year growth is down to around 21% this quarter, whereas growth in the year-ago quarter was just shy of 38%. Beyond this immediate numbers, there is the long-term viabliity of Twitter that some have brought into question as noted in this analysis by the Economist of London. It will be quite interesting to assess this evolution as the giants on the scene--Facebook & Google--battle it out. It was quite interesting that Google stumbled a bit.